#WBTourLondon Graphic Designer visits Harry Potter Studios! The only downside I found was that everything in the shop was expensive. I wanted a little gift for myself though and the Hogwarts Train Ticket was perfect at only £5 – especially that I got to actually go into the Hogwarts express. 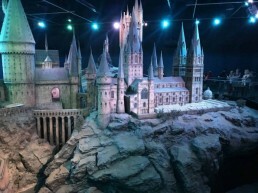 If you are interested in visiting #WBTourLondon visit there website and have a look at all the stuff you get to see. I am a Freelance Graphic Designer working under the brand Itchypalm and Sillyegg based in South Yorkshire. I have 8+ years experience within the Design Industry, spanning agencies, start ups and independents. Data points – what are they? Can Graphic Designers become catalysts of social change?